Delivery time: 1 Days within Germany. The sera aqua-test set is suitable for both fresh and salt water aquariums. The detailed instructions for use are enclosed for each test. 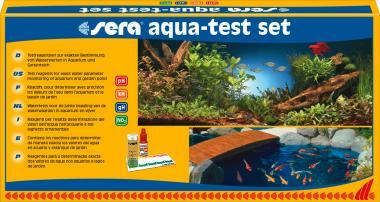 The sera aqua-test set makes an ideal gift for every aquarist. This is what you need when things goes wrong in the aquarium. especially in the beginning of the aquarium hobby. it's easy to use. Great set of tests for a low price. Only NO3 is missing from the usually needed freshwater tests. With no3 missing this set only gets 4 stars. no problem otherwise - buy it and find out what is really going on in yout tank. Easy to use for everyone. Very low price. Very good price for a complete kit necessary for the cycling of new aquariums! A complete box of tests, with high quality of SERA. Conjunto com os testes essenciais num aquário de água doce. Fácil de usar e bastante económico. un gran producto a un precio reducido, test de calidad, y muy faciles de usar, una gran pack!! Is a great product for started an aquarium, very good price-quality relation. Very very good. A must have. Very cheap and useful. You can save your fish and plants checking regulary values of your water. It arrived very good! But I was problems with plants. As easy as this kind of measurement can be. Measurement classes could be easier to fill if there is some kind of 5ml pump or so. Good set at a very affordable price. Best value for money and quality! This test set is much cheaper and better than most test strips I bought anywhere else! Perfecto de precio! !asi si se puede tener controlado el acuario por un coste muy bajo! Nice price and perfect product, it arrived with a due date after august of 2016. What i have to ask more? Best price, very good quality, essencial! Very good price. I recomend it! The best! A really good testkit but the corks are of bad quality. Be sure to twist hard and dont pull put let the cork come out of it self. Just received my water test kit here in Sweden, after only 3 days of postal transport! Cheap and accurate multi test. Recommended! Buy this instead of strips! Accurate and easy to use. A must have for startups! super quality on very good price! Anche se purtroppo manca il test per i nitrati, il prezzo resta eccezionale... anche perchè i test sono molto precisi.